2 for Little Ones Ou r to p selle r s for lit tle o nes These sweet books with adorable pictures help little ones see how their family loves each other, and learn how to pray about their day. 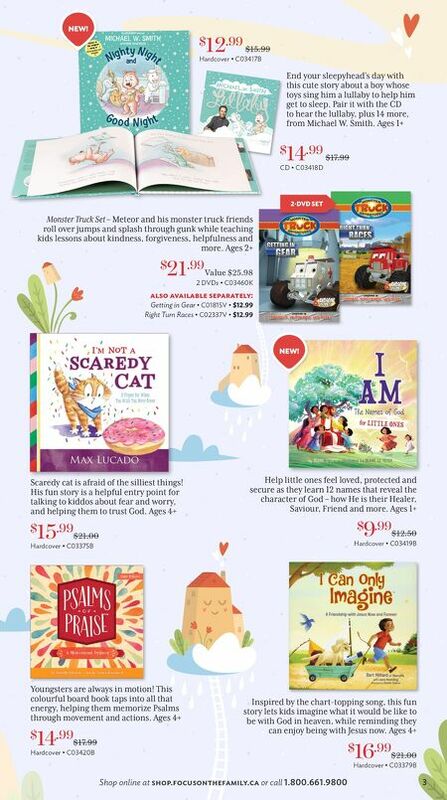 Ages 1+ $ 9 .99 each $12.50 Board Book Let's Learn About Set – Two cute stories that help youngsters memorize Scripture by visiting a farm, and by teaching the Lord's Prayer to a teddy bear. Both include a song for download. 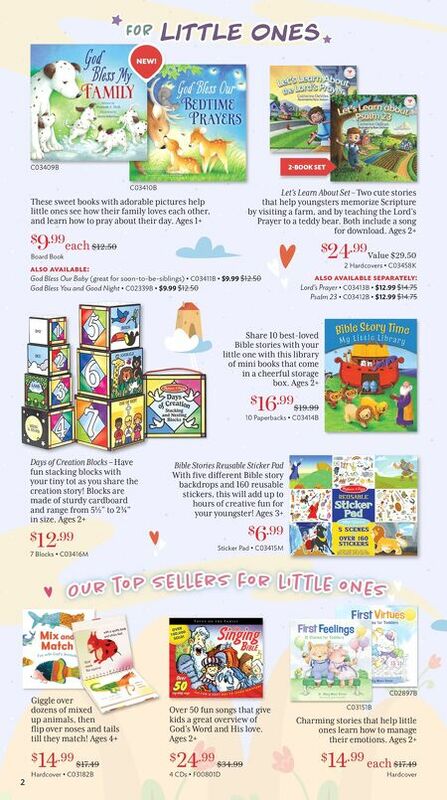 Ages 2+ $ 24 .99 Value $29.50 2 Hardcovers • C03458K Share 10 best-loved Bible stories with your little one with this library of mini books that come in a cheerful storage box. Ages 2+ $ 16 .99 $19.99 10 Paperbacks • C03414B Bible Stories Reusable Sticker Pad With five different Bible story backdrops and 160 reusable stickers, this will add up to hours of creative fun for your youngster! Ages 3+ $ 6 .99 Sticker Pad • C03415M Days of Creation Blocks – Have fun stacking blocks with your tiny tot as you share the creation story! Blocks are made of sturdy cardboard and range from 5½" to 2¾" in size. Ages 2+ $ 12 .99 7 Blocks • C03416M Over 50 fun songs that give kids a great overview of God's Word and His love. Ages 2+ $ 24 .99 $34.99 4 CDs • F00801D Giggle over dozens of mixed up animals, then flip over noses and tails till they match! Ages 4+ $ 14 .99 $17.49 Hardcover • C03182B Charming stories that help little ones learn how to manage their emotions. Ages 2+ $ 14 .99 each $17.49 Hardcover Ou r to p selle r s for lit tle o nes C03409B C03410B C03151B C02897B also available: God Bless Our Baby (great for soon-to-be-siblings) • C03411B • $9.99 $12.50 God Bless You and Good Night • C02339B • $9.99 $12.50 also available separately: Lord's Prayer • C03413B • $12.99 $14.75 Psalm 23 • C03412B • $12.99 $14.75 for Little Ones 2-BOOK SET NEW!